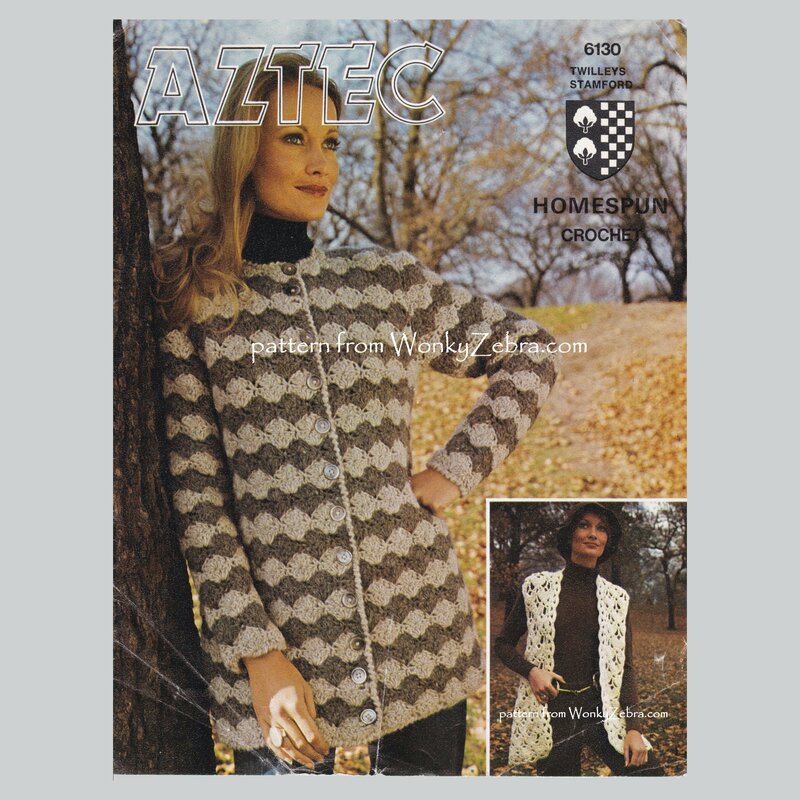 The WZ975 is a yarn driven pattern with a rather an odd combination of garments linked only by the yarn itself-and a “warm but lightweight” theme I guess. However both are very nice, easy to crochet and to wear. The car coat; named for those days of popping in and out of the car, for driving rather than serious walking requiring a heavy “sensible” coat. This one is shown in a 2 row stripe in the shell stitch; but it looks good in just one colour too (see above) and the length is easy to alter for a perfect custom fit, making a lightweight but cosy long jacket. The vest or waistcoat would make a warm layer without too much weight and is quick to make because of the large scale lace stitch pattern; choose a soft yarn for the same effect. 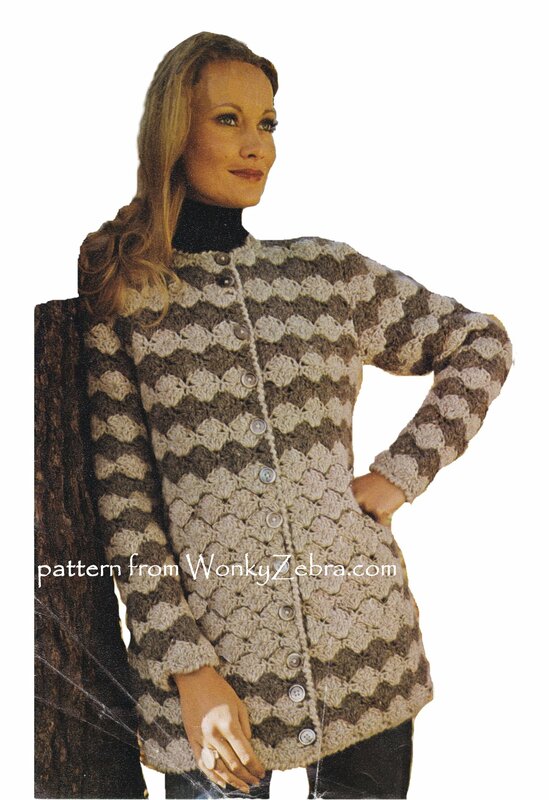 While I am on the subject of cosy crochet; this is a lovely jacket WZ687 – rare in crochet although I have many… ( many ! ) in knitting patterns. CROCHET: A wonderfully gothic looking long vest or waistcoat to crochet. This stunning vest/waistcoat pattern is from the late sixties… but before then this motif was usually used for tablecloths etc. 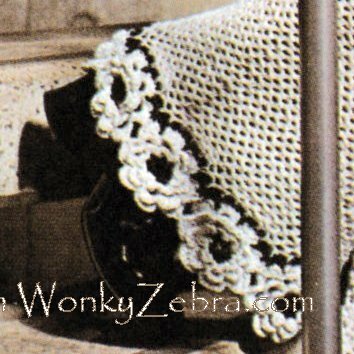 The motif is called a “Venetian square” and it has an almost tatted look to it, especially with the lattice work borders and picot loop corners. Especially if made in white…. …in this supersized large trellis, it looks so unusual; but chose a yarn with lots of body so it stays crisp. Cotton would be good, although the pattern is written for yarn. The motif would also be usable for other projects- fab cushions, pillows, or blankets… or even wall art pieces… just with a variation in the thread used. 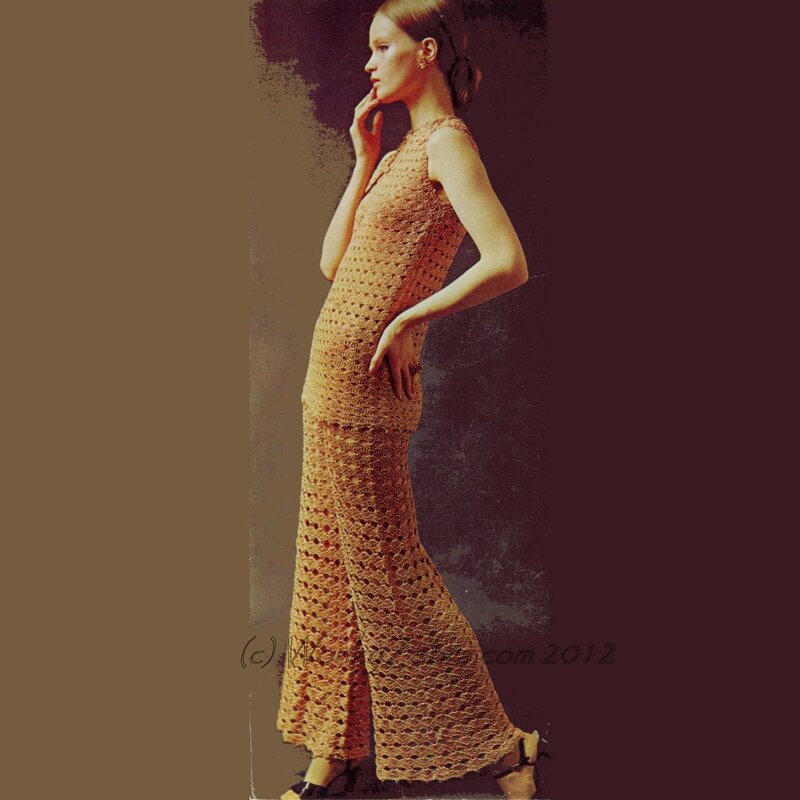 A crochet pattern for a “waistcoat /vest and sleeveless coat” in glittering gold and silver, straight from the 70s. I love crochet waistcoats and vests-as I may have mentioned in an earlier post LOL. The WZ 361 is a particularly nice pattern; a long, fairly plain (apart from the bling gold thread!) “sleeveless coat” and a really fab little top. Perfect for festivals, parties and for summertime in a cotton yarn. I love the detail of stripes and chevron patterning at the hem, which is also left without button, emphasizing it even more. The top would be very easy to make as a solid fabric instead of the open “granny stitch” mesh, if you wanted to make this in regular yarn for daywear. You could do without buttons altogether, if a tank top effect is preferred; or …how about a silky ribbon threaded through the start of the stripes and tied in a bow…? 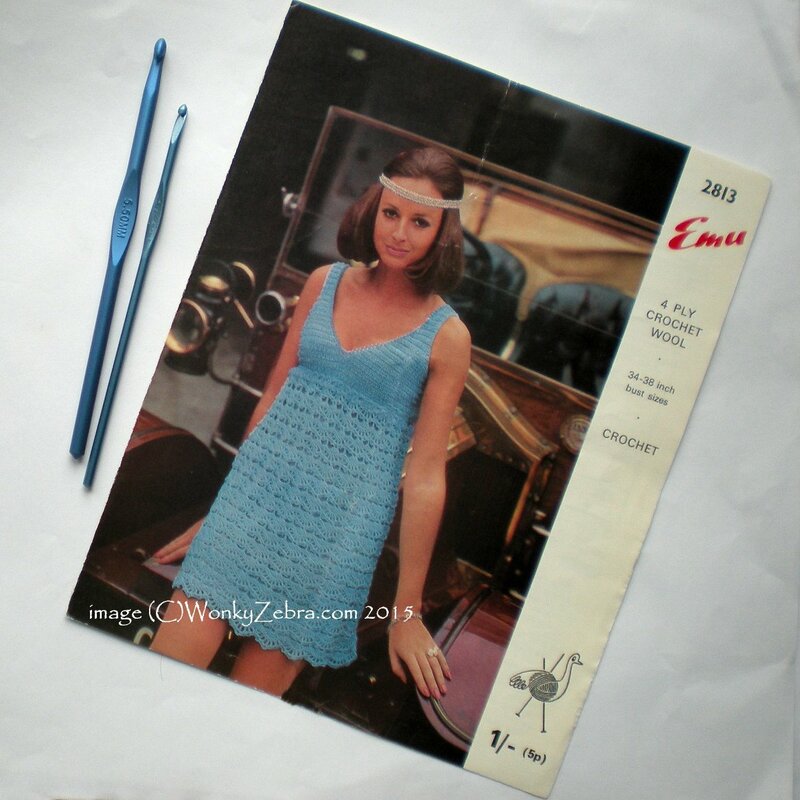 Retro Sixties Shift Dress PDF Pattern WZ 00974 just listed; super stylish, easy & quick crochet. A perfect project for summer days and practically any occasion. 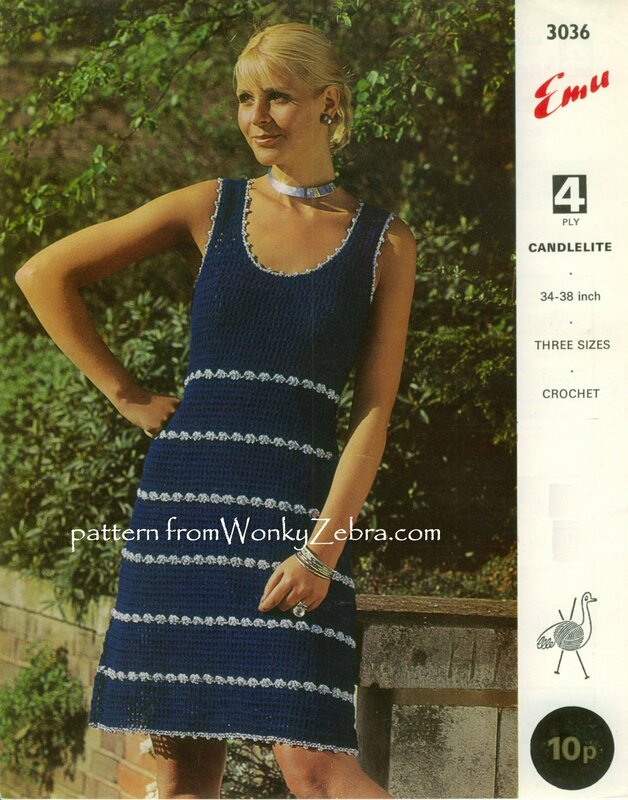 Here is one of the latest crochet dress listings; another I have from the Sirdar “Summer Breeze” range (see also WZ 709 and WZ 710). 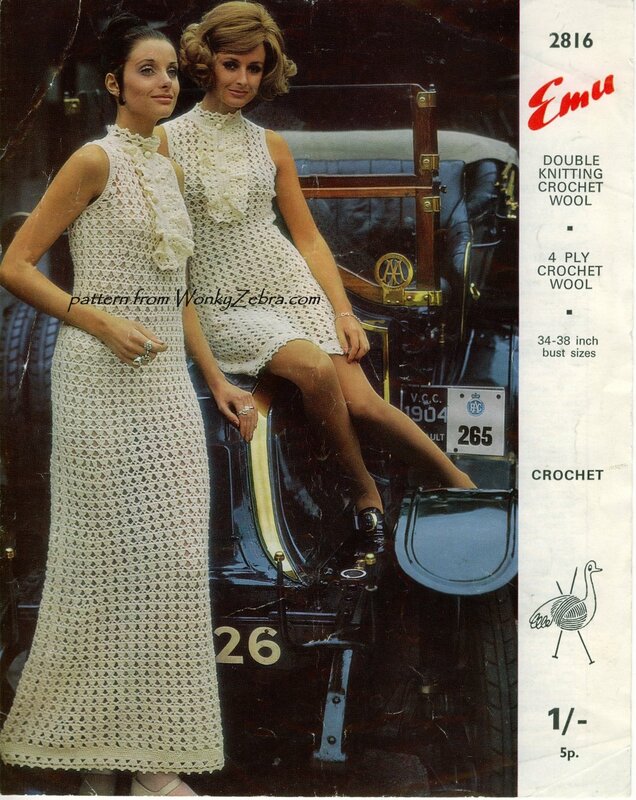 Sixties style crochet shift dresses; still completely fresh and wearable even after all these years. This style is SO useful in one’s wardrobe; elegant and quick to crochet too! “Summer Breeze” was a bouclé cotton – worked with a 3.00mm or 3.5mm hook. Aptly named in this case, as these styles are, indeed, a breeze to crochet! The cotton yarn has lots of texture so the stitch patterns are simple-but look very effective. I have so many crochet patterns for these dresses (and also some knitted ones too) and they make lovey first garment projects too. Black and white, always eye catching and in clothing usually chic; or smart at the very least. Hence a ubiquitous combo in workwear of all kinds (and understandably a favourite of WonkyZebra). The late sixties took it to a new level fashion wise, with an explosion of Op Art looks in shiny new textiles. Courreges took it space with his futuristic shapes and outrageous plastic and metal textures; but Mary Quant was our local heroine using it to great advantage with her signature daisy motif, simple mini dresses and lots of wearable looks. 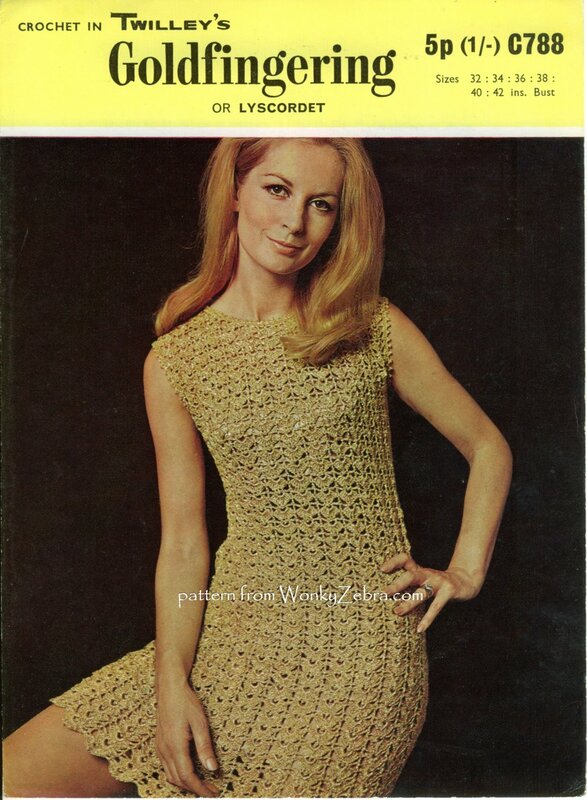 And yes, she even endorsed some crochet and knitting patterns! Anyone with needles or hooks could easily make these fashions for themselves. 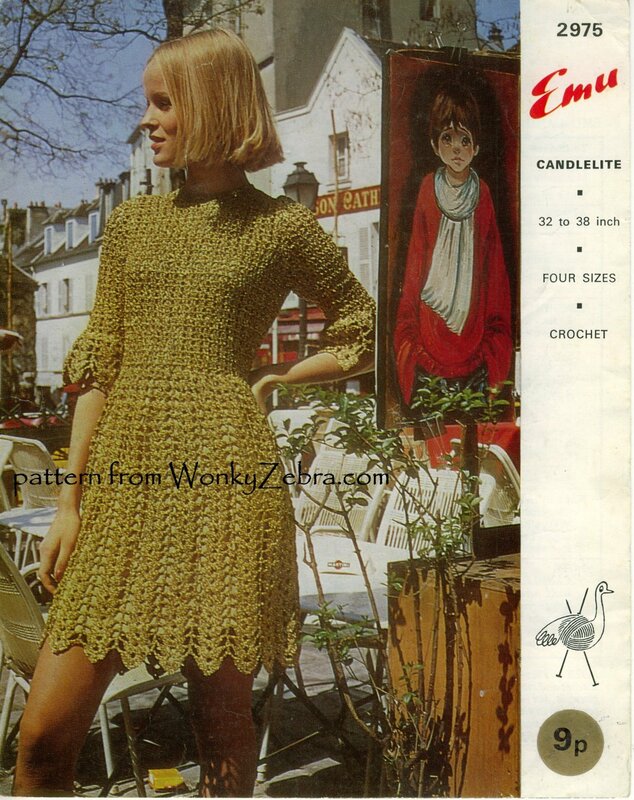 Crochet patterns had been quite vague by modern standards, but pattern writers began to produce really usable patterns aimed at fashion conscious women who wanted “the look”. 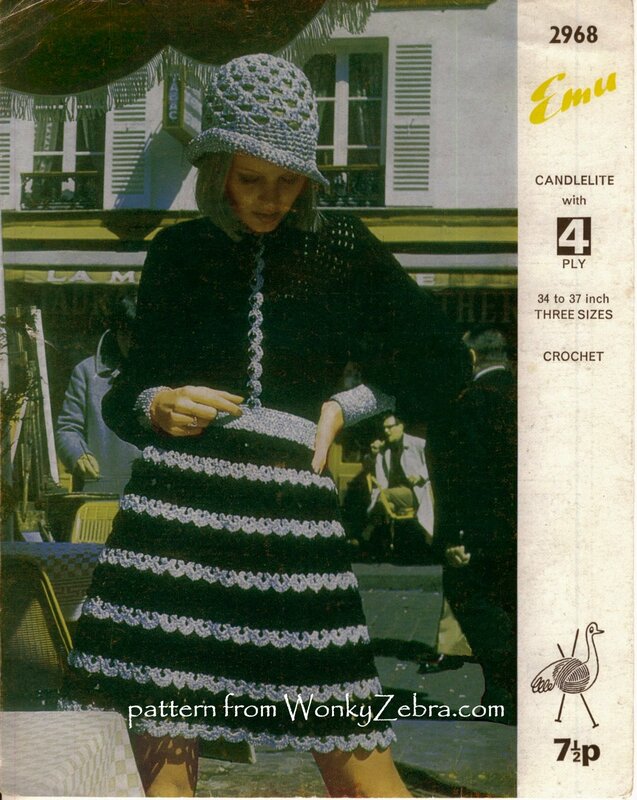 For me, some of the best crochet patterns were from Twilleys, as the “Barbara Warner couture crochet” range. 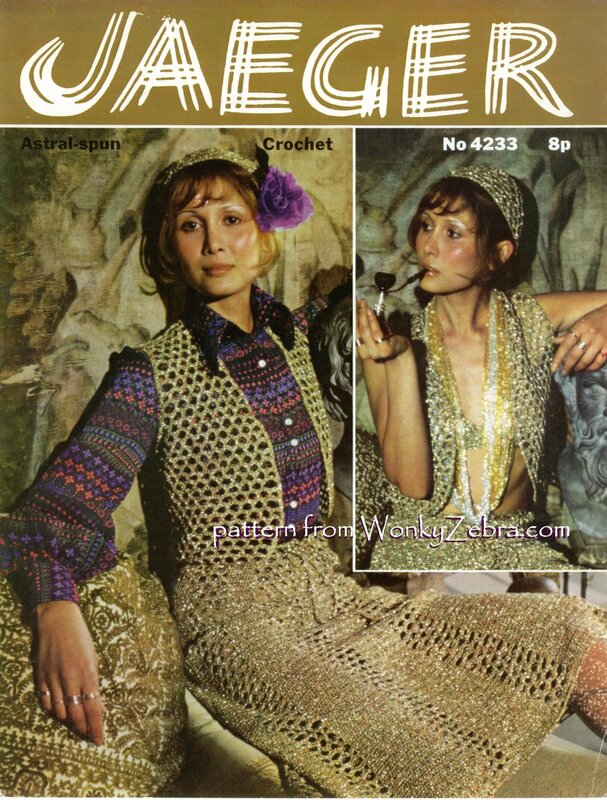 These were always super stylish, really pushing the boundaries for homemade fashion, yet written in a clear, easy to follow format aimed at newbie fashionista crocheters. The patterns are written in a logical way, really embracing the 3D possibilities of crochet compared to the standard knitting pattern format of the time. They are usually worked top, or waist, down and often in the round, without side seams etc. And another dress with a similar idea, the “vintage Paris chic” WZ395 in bands of “spider web”stitch lace. I love the white one with black velvet ribbons- but this is a good example of how the other versions change the look considerably. Lots of other pattern houses also produced stylish crochet patterns; Lister developed their own distinctive look in their “Crochet Festival Set” range (appropriately named for us now with all the music festivals; but the name inspiration was the new, brutalist, South Bank Festival Hall, as shown in this image). They had stitches and weren’t afraid to use them – creating dresses, tops and even trousers, in fab lace textures. These are great if you really like the lacier possibilities of crochet. At the full on crochet glam end of the spectrum this “festival” evening outfit has it all”! Crochet lace, crochet flowers and crochet trousers – with more crochet flowers… yup – she crochets! This looks intricate but is surprisingly simple crochet work – very clever! The tunic over trousers look goes on and on as it’s always so wearable; but either of these pieces would work on their own too. Of course you would need a crop top, to wear with the the trousers; which is still a very retro style! You could even just make the flowers for a fab festival head band! The flowers are made then crocheted together along one edge (after which the marathon of the trouser leg continues). If you crocheted around the other side instead… instant headband. I was recently sent this made in many colours of stash busting cotton; it looked completely different-and just as stunning. So, they will work for daytime in good old plain cotton, but if made in a glittery thread – pow ! Party mode 🙂 . This wonderful trouser, palazzo or pantsuit – depending where you are- looks stunning in this metallic thread. It is made in Twilleys “Goldfingering” thread which is beautiful… and still available! Maybe I should put that in capitals, as substituting for a vintage thread seems to cause such angst. I do send my own notes to help with all my pattern sales… but people’s access to yarn varies so much, so it is impossible to give a definitive alternative for each pattern or yarn. It is thin (thinner than 4 ply) but very dense; it has wonderful drape as a fabric once made, although it is a little springy and scratchy to work for the first few rows. It is also quite heavy to wear, but wonderfully swishy. Or, to wear over any plain evening dress, this delicate “Irish crochet” jacket. 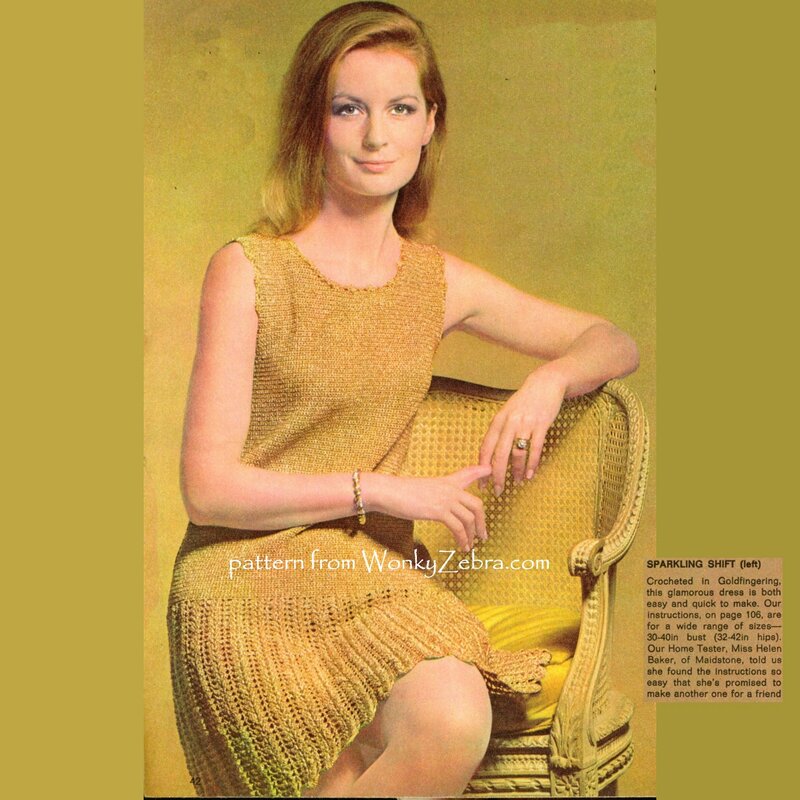 Here is a little find from a family circle magazine; a dainty dropped waist dress… and a bonus gold suit with it! “Other metallic yarns are available”. As they say on telly! Jaeger had “Astral-spun” used for the 630 above and this fab set. The outfit is such a useful one in any combo; but she is another one who looks a little worse for party wear, like her mate from the previous post. Another pantsuit – this one from Ladyship wools; very on trend for a retro seventies look… the chain belt is option, they helpfully point out! 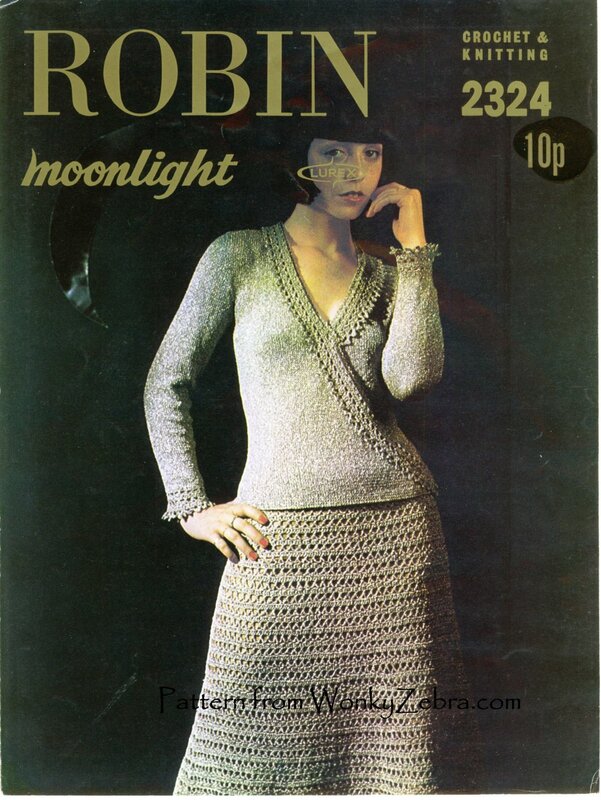 Robin had a yarn called Moonlite… very glittery and with some interesting evening garments that are both knitted and crocheted. The logo had a curlicue outline which some bright spark took delight in placing on the models features -with varying degrees of weirdness! This one has amazing sleeves and square neckline… and an unfortunate dripping nose logo placement! The other is a short outfit with a crochet textured skirt and detailing (and only a “teardrop” of logo thankfully!) I can hardly bear to mention the pathetic attempt to theme the styling with a naff silver paper “moon”; they didn’t even have enough for a whole moon LOL… It is hardly noticeable on the dark background, so I don’t know why they bothered. Or how about this scrumptious full on “dolly bird” dress from the sixties. It has the fitted bodice, slightly high waistline and short flirty skirt that was such a flattering combo. It is from Emu, in “Candlelite” yarn. Actually I have several with this thread; all from the same styling set (which is a tad tacky to be honest ). Another themed link ( the “Candlelite” /romantic one ) they obviously went on location to romantic France, but only had one hat between them! I do like those shapes; neat bodices and nice skirts! The next one is also neat but moving into the seventies with a midi length and deep scoop neckline. The candlelite is used as a bobble band edging and insert trim, like braid, on this one. 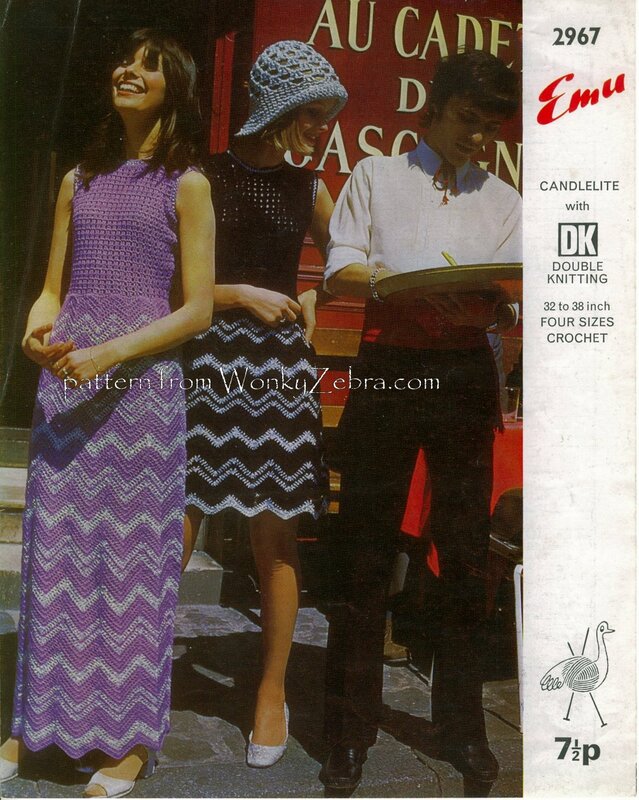 The Emu team must have liked a good party; now I look, lots of the dresses I am thinking of this time are from Emu. Here is another one in a different yarn, beaded and “20’s flapper” inspired. ( I would leave off the headband unless its for fancy dress). Then there are these dresses with the iconic-and briefly trendy, jabot neckline. This is a home based styling set, posed around some even more vintage cars. I have a lot of patterns taken with this setting, so it is easy to date them all together. This is worth a close up as it is, unusually, a clear photo. Just look at the statement rings and the change of decade hairdos! Now this charming dress is moving back to the crossover day to night kind of dress… maybe even Emus get tired of full on party mode! And here is Jaegar getting back in on that style with this neat dress. I will let you have a little drool over these-they speak for themselves really! Just bear in mind they are completely customisable… you can lengthen – or shorten… go for pastel, moody dark colours, sultry black… or even neon if you like! PS just a sad note to add; you may see some of these on sold elsewhere on Etsy. Some by other bona fide pattern sellers, but a few are in the shop of a Kiwi seller, being sold with my logo partially erased and no permission from [or payment to] me. She was given them, to make on commission, from one of my customers 😦 A bit cross about that; I would happily have shared if asked!